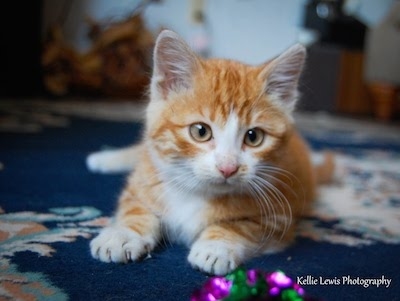 Only 6 to 8 weeks old, sweet little Gingersnap was found as a stray. When examined by a veterinarian she was found to have a right hind limb fracture and a large abdominal hernia; the hernia is so big that her bladder has slipped through. Although we don’t know exactly what happened to her to cause these injuries, we can say that she certainly experienced significant trauma to do this degree of damage . Nevertheless, she purrs constantly whenever anyone is holding or petting her. Since she is otherwise perfectly healthy, Gingersnap is a perfect candidate for surgery and is expected to recover completely and live a long and happy life. Surgery, however, will cost $2,500.00. Please open your hearts to Ginger snap and help us help her. See our Lending a Helping Hand Page to donate via PayPal, Google Store or mailing instructions.